I would like to introduce you to my friend TJ from Any Given Moment. She has become a blogging friend, as well as an e-mail buddy, and she's pretty swell! Recently, she gave out some blog awards, and I am supposed to choose one from the three she received. 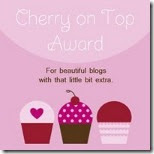 I am going with the 'Cherry on Top' Award - basically because it's cute, and it involves cupcakes! I would like to pass it on to 5 deserving bloggers. Pass it on. Thanks for the cute award, TJ!